We are enthusiastic about amateur dramatics and welcome new members of any age and skill – come and join us! There is something for everyone, whether you want to act on stage or join the backstage crew. We normally perform 3 productions a year, which may include a Juniors production. The first known record of a play being performed in Hamble was on 14 February 1920 when the Hamble Dramatic Club gave 2 performances involving 3 sketches and a farce in aid of funds for the “new” Memorial Hall. In 1947 the group became known as the Hamble Dramatic Society. The first production was While the Sun Shines followed by Flarepath, The Wind and the Rain and Acacia Avenue. The producer in those days was Mary Goodhand who was a Sister at the Airfield Hospital. The cast was mainly drawn from students of the Training Division of the College of Air Training. A behind-the-scenes stalwart was Fred Keeping, the village taxi driver. Rehearsals were held either in the back room of The Victory Public House in the High Street, or in the old Rectory. All the scenery, like today, was erected by the cast and often large items had to be carried through the village to the Memorial Hall! 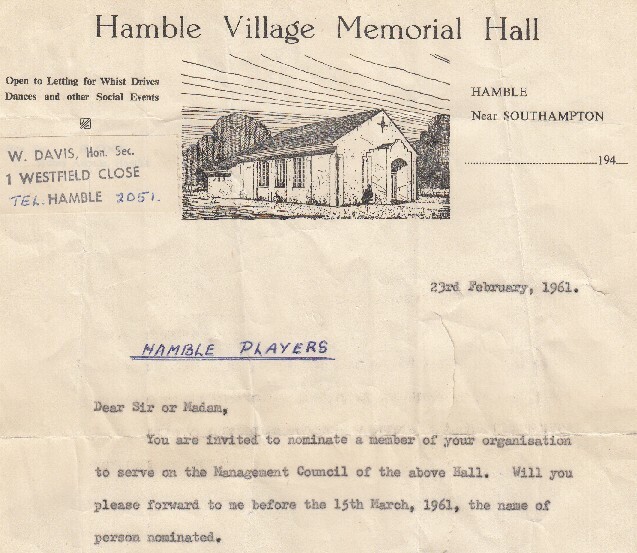 There have been a number of groups in Hamble since then but the Hall minutes record the Hamble Players as a new organisation in January 1955. In 1956 the Players performed jointly with the Folland Amateur Dramatic Society at the Folland Aircraft Theatre. Stuart Jacobs was the principal Director for many years and it was Stuart who set the high standards the Players enjoy today. He had a unique relationship with the playwright Falkland Cary and the Players previewed some of Falkland’s plays such as Train Fever and Proof of the Poison, before they were performed professionally. In the 1960s the Hamble Players put on regular performances for the boys of TS Mercury, a local maritime college. Stuart died in 1967 and to this day, each year, we present our Stuart Jacobs Silver Salver (valued at over £800) to the actor whom Members have voted “best performance of the year.” Since their inception the Players have performed many notable plays including Othello, Under Milk Wood and Arms and the Man, the first Nuffield Theatre production in 1972. The Players were also renowned for Old Time Music Halls, performed each summer in aid of the local carnival. In the early eighties the Players entered a competition staged by the BBC, called “Support Your Local Theatre”. Performing on BBC South Television, the Players went on to win, despite some very strong opposition from rival companies around the South. In the eighties, when Dulcie Gray was patron, the miners strike meant power cuts with little or no warning. This happened on one particular night during a performance; the ever-resourceful Players continued by shining headlights from cars through two doors on either side of the stage. Appropriate sound effects were produced with voices. Since those days the Players have maintained the high standards set by their predecessors. Apart from being renowned for the production of comedies and farces, Hamble Players has had great success with dramatic productions such as The Lion in Winter, The Dresser, and Rebecca all in the 1990’s. More recently Journey’s End (March 2002), Beyond Reasonable Doubt (September 2004) and A Christmas Carol (December 2009) have all won Curtain Call Awards; and Hamble Players won the 2007 “Pantomime of the Year Award” for Frankenstein, the Panto. Our other internal annual awards (voted by the Membership) celebrate two Hamble Players stalwarts, who were both members for many years. The Evelyn (Wakeford) Shield is presented each year to the actor whose performance improved most from first rehearsal to last show. Evelyn was a fine actor, our President and our Treasurer. The Don Bishop Plinth is presented to the Member who has made the best off-stage contribution. Similarly Don was another fine actor and served as Chairman; a particular speciality of Don’s was the production of incredibly realistic sound effects using an ancient reel to reel tape recording machine. The players celebrated their 50th anniversary in 2005; so for over 50 years Hamble Players have enjoyed, and continue to enjoy, an excellent reputation. We are very pleased that you have chosen to have an interest in Hamble Players and on behalf of the Committee and all the members, we would like to wish you a very warm welcome if you decide to join. We welcome new members and hope that you do join and have many happy years with the Group. We actively encourage anyone who is interested in the theatre to join us and participate in the productions or assist with the many fund-raising or social events that we organise. Please don’t feel that because you are a member you are obliged to go on stage, as our productions also involve set building, front of house, as well as assisting the stage manager with properties, sound, lighting and set movement. Our productions are usually directed by different directors and any member is able to suggest a particular play or musical to the Committee for consideration and, providing they have suitable experience, can request that they be considered for direction. Each director, once appointed, will hold auditions for their production and all members are encouraged to take part. If you have not been involved on stage before it may be better for you to consider auditioning for a small supporting role to gain experience and confidence. Hamble Players regularly produces music hall revues and pantomimes that provide a wide range of small roles. Please note, attending an audition implies that you will be available to participate in that production, even if you do not get a part. Hamble Players prides itself on the high quality of its productions and so there is always a great deal of help needed from all the members to bring each production to the stage. We produce either three or four productions a year, all of which are held at Hamble Village Memorial Hall. Rehearsals are held according to a schedule produced by each director although in general these are each Monday and Thursday evening at 8.00 p.m. at the rehearsal hut, which is behind the Hall. Members may come to these rehearsals whether or not they are directly involved in the production. A regular newsletter is sent out to ensure that members are kept abreast of activities and the regular social get-togethers. Please keep us up-todate with your address, contact telephone number and e-mail so that we can ensure you get your copy. Our annual subscription in 2014 was £25, which may be paid any time you come to the rehearsal hut. Once again, a very warm welcome to you and we look forward to seeing you regularly when you join.